The Liebert NXC 10 - 40 kVA range offers reliable secure power in a fully integrated package solution. Its combination of performance features, multiple internal battery configurations and three phase/single phase output flexibility, make it an ideal choice for a wide range of applications from IT and manufacturing to retail and transport. 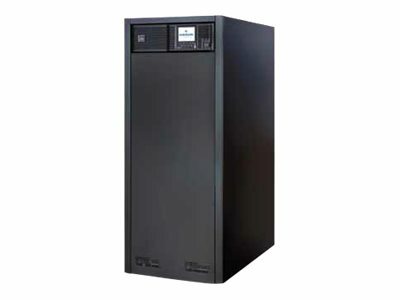 The Liebert NXC 10 - 40 kVA range offers reliable and flexible secure power in a fully integrated package solution. Its highly efficient transformer-free double conversion technology delivers installation and running cost savings. Liebert NXC achieves up to 95% efficiency in double conversion mode and up to 98% in Eco mode, thus ensuring effective load protection, while reducing the total cost of ownership (TCO) and environmental impact. With a rated output power factor of 0.9, Liebert NXC is also able to provide 12.5% greater active power than a traditionally rated 0.8 power factor UPS. Liebert NXC spacious internal architecture is able to house up to four battery strings which results in a backup time of up to one hour and virtually eliminates the need for an external battery cabinet. Liebert NXC autonomy can be further optimized choosing between different battery string lengths, from 32 to 40 12V blocks.